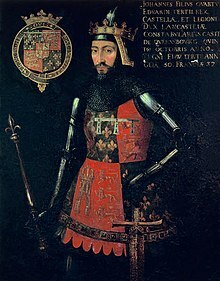 John of Gaunt (John Plantagenet, 1st Duke of Lancaster, 1st Duke of Aquitaine, 6 March 1340 – 3 February 1399) was a member of the House of Plantagenet, who ruled England for over 300 years. Gaunt was the third surviving son of Edward III and Philippa of Hainault. He was the father of Henry IV. Gaunt was a younger brother of Edward, the Black Prince. He had great influence over the English throne during the childhood of his nephew, Richard II, and during the ensuing periods of political strife. He is not thought to have been an opponent of the king. John of Gaunt's legitimate male heirs, the Lancasters, included Kings Henry IV, Henry V, and Henry VI. His other legitimate children included, by his first wife Blanche, his daughters Philippa of Portugal and Elizabeth, Duchess of Exeter; and by his second wife Constance, his daughter Queen Catherine of Castile. John fathered five children outside marriage, one early in life by a lady-in-waiting to his mother, and four by Katherine Swynford, Gaunt's long-term mistress and third wife. These were surnamed Beaufort (after a former French possession of the Duke). The Beaufort children, three sons and a daughter, were legitimised by royal and papal decrees after John and Katherine married in 1396. Their half-brother Henry IV added a later proviso that they were barred from inheriting the throne. Descendants of this marriage included Henry Beaufort, Bishop of Winchester and eventually cardinal; Joan Beaufort, Countess of Westmorland, grandmother of Kings Edward IV and Richard III; John Beaufort, 1st Earl of Somerset, the great-grandfather of King Henry VII; and Joan Beaufort, Queen of Scots, from whom are descended, beginning in 1437, all subsequent sovereigns of Scotland, and successively, from 1603 on, the sovereigns of England, of Great Britain and Ireland, and of the United Kingdom to the present day. The three succeeding houses of English sovereigns from 1399 — the Houses of Lancaster, York and Tudor — were descended from John through Henry Bolingbroke, Joan Beaufort and John Beaufort, respectively. Lancaster's eldest son and heir, Henry Bolingbroke, Duke of Hereford, was exiled for ten years by King Richard II in 1398 as resolution to a dispute between Hereford and Thomas de Mowbray, Duke of Norfolk. When John of Gaunt died in 1399, his estates and titles were declared forfeit to the crown as King Richard II named Hereford a traitor and commuted his sentence to exile for life. Henry Bolingbroke returned from exile to reclaim his inheritance and depose Richard. Bolingbroke then reigned as King Henry IV of England (1399–1413), the first of the descendants of John of Gaunt to hold the throne of England. Due to some generous land grants, John was not only one of the richest men in his era, but also one of the wealthiest men to have ever lived. Taking into account inflation rates, John was worth a modern equivalent of $110 billion, making him the sixteenth richest man in history. ↑ Including the cadet branches, the House of Lancaster and the House of York. ↑ 3.0 3.1 Given-Wilson, Chris (general editor). "Richard II: September 1397". Parliament Rolls of Medieval England. Institute of Historical Research. Retrieved 8 June 2013. ↑ Fleming, Olivia (15 October 2012). "Meet the 14th Century African king who was richest man in the world of all time (adjusted for inflation!)". Daily Mail. This page was last changed on 6 April 2019, at 15:34.